New selection of black metal records released in 2018. 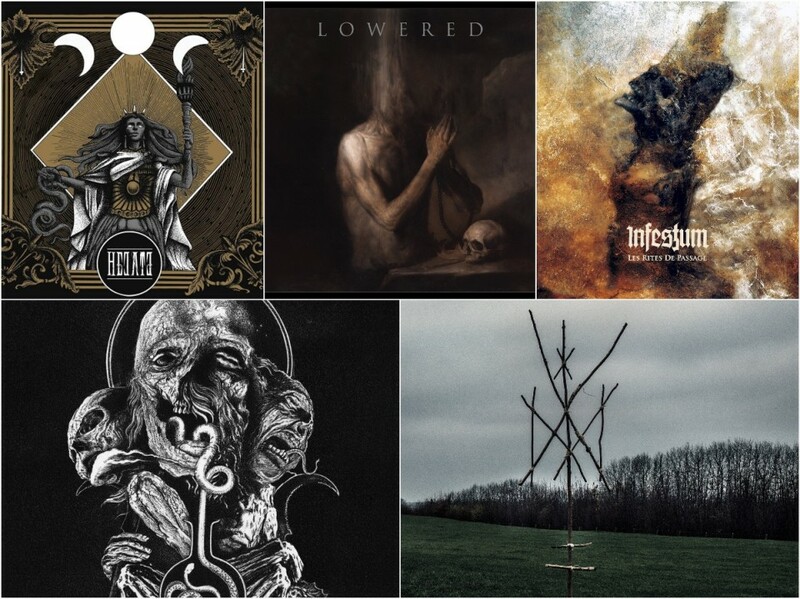 For the new Check 'Em All material, we chose EP and full-length albums from such acts as Vhorthax (RU), Infestum (BY), Hecate (FR), Lowered (US), and Wiegedood (BE). What a pleasant surprise this was, "Nether Darkness" is a solid piece of black/death, pulling influence from bands like Arkhon Infaustus, He'll Militia, Ofermod, Revenge, Archgoat and a whole heap of classic death metal. At times it has the feel of more modern black/death acts whilst at others it devolves into bestial War worship or groove laden 80’s brutality. One thing that benefits the album greatly is the quality of production; it's thick, dark and atmospheric, creating a huge imposing experience in the listeners ear — a particular mention to the drum production, I can't remember the last time I heard a drum sound so alive, it sounds like a kit rather than a clicky compressed bunch of samples. "Nether Darkness" does enough to take from its influences and starts to create something unique, it's not there just yet but I'm sure by the next album their individual tone will have developed enough for them to stand separate from their influences.This album has fully earned its title of "Nether Darkness". Of all the sub-genres that black metal has spawned, it is surely the industrial influenced that is the hardest to produce competently. Electronics are often an afterthought, with basic black metal parts laid down and then electronic elements inserted after the fact, the rare exception is when the songs limit the inorganic instruments yet provide cold, mechanical riffs that feel like a cybernetic juggernaut — bands like Thorns, Zyklon, and Blacklodge have nailed this style superbly. Infestum fall into the former bracket, their industrial tendencies a mere sprinkling on stock black/death riffs. At times they call to mind bands like Marduk, Diabolicum, Thorns and Aborym, unfortunately never with the same interest those bands generate. That is not to say all hope is lost, there are moments and elements that show promise, "Descent of Yore" displays the power of a song being built upon a mechanical base and it's the most compelling track on the album. "Digitus Dei" and the title track pull back on the symphonic elements to become a more imposing beast, yet the spell is broken when the orchestral parts come into play. There is definite promise within the project, there is certainly a good understanding of electronic elements and there are some good riffs, however, for the project to be on par with the iconic Black Industrial albums of bands like DHG, Thorns, and Aborym (at least until Nysrok left) there needs to be a greater emphasis on one of those concepts — either strong electronic bases or killer riffs that are elevated by electronic elements. I will confess that symphonic elements often detract from the strength of an Industrial album for me, they harbour too much warmth and happiness, alien sounding instruments evoke colder and darker emotions, something I think that could be utilised more by Infestum. As far as countries go in the battle for most impressive black metal resume, France would have my vote for most impressive, the sheer volume and quality of bands that have emerged from the land of the Gauls from the dawn of black metal is astonishing, whether it be traditional black metal bands from Les Légions Noires, the intensity of bands like Antaeus and Arkhon Infaustus, innovative and genre-bending groups like Deathspell Omega, Peste Noire, Diapsiquir and Blut Aus Nord or modern interpreters of the past like S.V.E.S.T. and Haemoth; there is a certain expectation to live up to for any French band that emerges. Hecate serve up a fairly homogeneous version of black metal, it feels like strong second-wave worship viewed through a French filter. "Une voix venue d'ailleurs" recalls more contemporary second waves bands like Sargeist, Urgehal and Svarttjern mixed with the more grandiose leanings of Blut Aus Nord's melodic records like Memoria Vetusta. There is very little new on display here, it is well composed though, the riffs and structures are old-hat, the music doesn't come off as cliche though, it feels nostalgic more than it feels like a cheap attempt at imitation. There is a passionate commitment to the music which often feels absent in a lot of more modern second-wave worship, maybe it's just the excellent and punchy production or perhaps this is a band that is truly committed to creating a good standard of 'classic' Black Metal, it may not be at the level of the 'Ile-de-France' crowd but it's a solid outing. Listen to also: New Rauhnåcht's album "Unterm Gipfelthron"
Hailing from Portland, Oregon, Lowered produce a style of black metal that is miles away from the Cascadian trend that has emerged from that area over the past few years, stylistically they sit closer to the tight enclave of Swedish bands like Ofermod, Mortuus, Ondskapt, and Malign, their brand of black metal, is slow, doom-ish and a veritable wall of sound. The most striking thing about Lowered is its dense production, sounding closer to a death metal album than black, "Lowered" is an intense excursion into a type of black metal not often witnessed in black metal bands in the US. The songs, for the most part, are mid-paced affairs, typified by slow unravelling riffs, punctuated with atonality and morose howls. At times there is a shift to pure doom passages, only to give way to more uptempo beats or all out blasts. My only gripe with the album is its short run time; clocking in at just over half an hour. The way the album builds atmosphere and tension is fantastic but a few more songs would propel this into the realms of brilliance. The four songs provided, display some killer riffs and truly memorable additions to the catalogue of black metal, with just a couple more songs this would have been a classic debut for their niche. If you listened to any of the Wiegedood albums this is more of the same, repetitive and long tremolo riffs, old school blasts, traditional high pitched reverb-soaked vocals, with everything drowned in a treble. If you haven’t, Wiegedood is what you get if you locked a group of individuals in a room with "De Mysteriis", "Transilvanian Hunger", "Nemesis Divina", "Nightside Eclipse", "Pentagram", and "Filosofem" for twenty years with nothing else to listen to. The length of the tracks would suggest 'atmospheric black metal' in reality it just means riffs repeat endlessly until segueing into yet another repeating tremolo section supported by second wave drumbeats. Devotees of the 2nd wave will surely love it — personally, I think it’s rather bland and brings nothing new to the table.